The Evolvienna Spring Symposium will take place on May 9 at the Vienna Biocenter Campus (IMBA lecture hall, Dr. Bohr-Gasse 3). 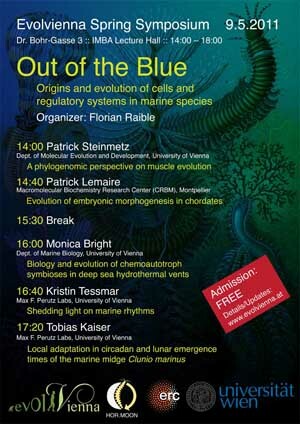 The thematic focus of this symposium will be on evolution from a marine perspective. As the ocean is believed to be the cradle of evolution, the investigation of marine species has particular interest for evolutionary research. Our speakers cover a spectrum of different evolutionary topics, ranging from gene-regulatory networks and cell type evolution to the evolution of symbioses and molecular marine chronobiology.